I am looking forward to some cooler weather. In Texas that can take a while - as I write this it's in the 90's. In the meantime, I am trying to encourage the cooling off to begin by creating this fall themed coffee card for the awesome Coffee Lovers Cardmakers Blog Hop. I created 3 cards, only one of which was destined to be added to the hop line up, but wanted to keep them in here as bonus cards with a fall theme. I started with some cream Rangers mixed media heavyweight cardstock and die cut all the leaves out. 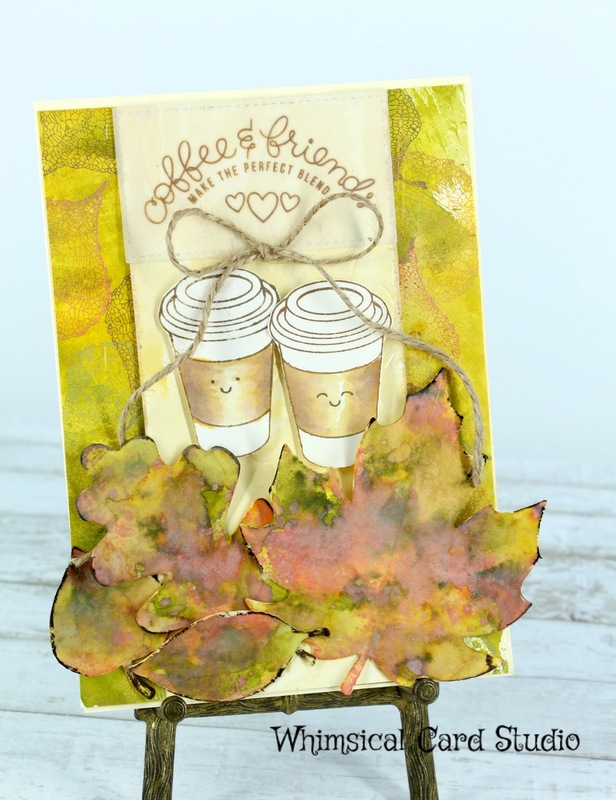 I then used Distress Inks & Oxides to add fall color. I added plain water to the paper, then painted on with one ink color at a time, drying in between so that the colors did not blend together. I used a heat tool to dry and this was one of those times where I wanted the paper to buckle and add to the fall leaves effect. I also colored a cardstock layer on a 4.5" x 6.25" piece of cream cardstock as a backdrop with the same distress inks and stamped over top of it with a leaf stamp (links to all products below - some are affiliate - full disclosure). I later trimmed it down a 1/4" on all sides so that it would be framed by the card base when I put the entire card together. I created a middle layer with cream cardstock and embossed it using the same leaf dies. You need an embossing pad in order to run it through a manual die cut machine (I use the Big Shot) and only leave the impression like an embossing folder. 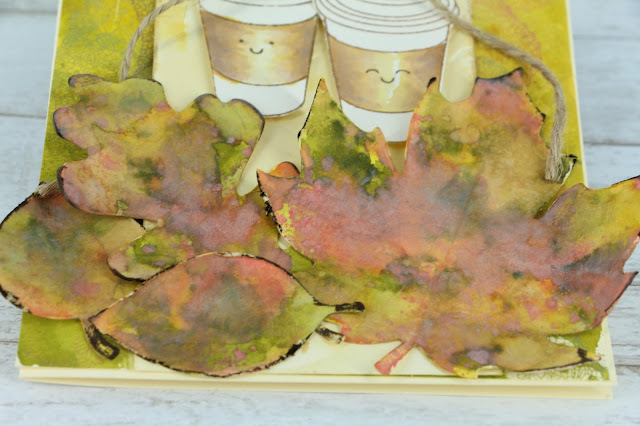 I distressed the edges on this panel as well as the edges on the die cut leaves to add more interest and texture. The link I added to leaf dies below is not the set I used here. I discarded the packaging some time ago and cannot recall what brand they are. At least there are alternative. The ones I linked are from a new release from Pretty Pink Posh. The coffee cups were stamped, watercolored with Distress inks and then fussy cut. The sentiment was stamped onto vellum, stamped with this color Distress Oxide, then I sprinkled on some cocoa powder (just kidding - seeing if you're awake here - if not get more coffee!!). I actually used clear embossing powder and heat set it. Used spray adhesive on the back of the vellum and glued it down at the top of the card on top of the cream layer. 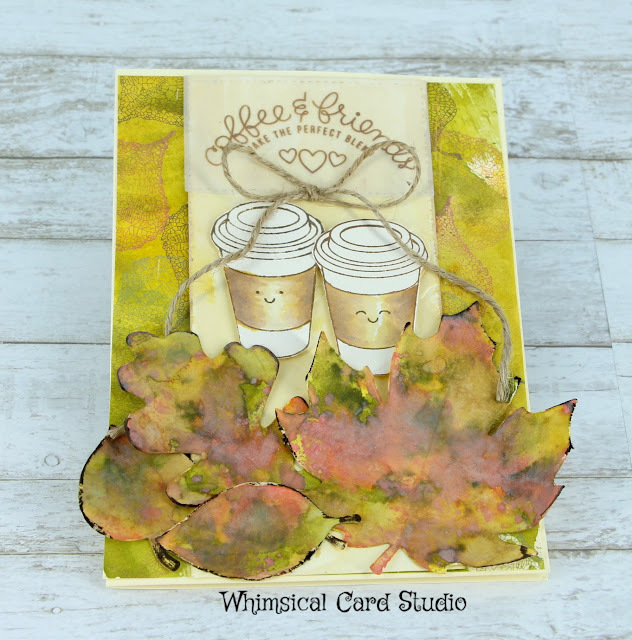 I glued the leaves at the bottom and then the coffee cups to finish the front card panel. I then adhered the panel to an A6 card base (6 1/4" x 4.5" when folded) and that completed the card. These two were created based on an idea I got from Justine Hovey. She's known for her CAS (clean and simple) style. She said she was fine with me CASE-ing her card from this post, which I'm doing while making it fit in more with my style. When I die cut the leaves for the first project, I cut them out of two 4.25" x 5.5" cardstock panels in cream strategically so I could make two shaker cards while using the leaves for the coffee card. I colored both the panels in the same manner as I did the leaves. I think that I would have colored the panel, then die cut the leaves but at first I wasn't sure I was going to color them the same way, then changed my mind. I embossed ivory colored cardstock with an embossing folder so there would be texture shown as the backdrop for the sequin shaker window. Here's a close up of one of the two cards showing off the gorgeous gold embossed sentiment. I really love the Honeybee Stamps for large stamped sentiments and have collected quite a few sets. the sequins used in both these shaker cards are mixes that I also purchased from Honeybee Stamps. What I love about them is the variety of shapes, sizes and colors. If you look close at the previous photo you can see what I mean. 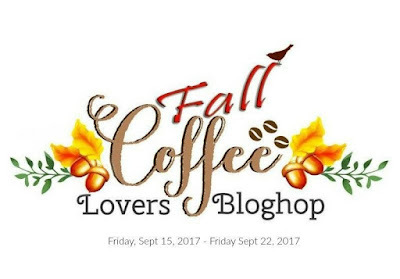 Thanks again for stopping by today - as an added surprise - please be sure to leave a comment for me to let me know you stopped by - I will be giving away a $10 gift card to Starbucks to one randomly chosen winner from all the commenters. Deadline for drawing is 7 pm Central on 7/26/17 - please stop by then to see if you are the lucky winner. Oh, wow, Teresa....these watercolor leaves are amazing. You really rocked these! Thank you Karen for stopping by and leaving the first comment - you are now in the drawing! So graceful and pretty creations, love them all!!! How sweet of you! Thanks for leaving me a comment and stopping by. Such gorgeous cards, love how you did those pretty leaves. Amy - thank you so much for stopping by and leaving me this feedback! Those leaves turned out gorgeous! Beautiful cards. Hi Rebecca - so glad you stopped by and thank you! Oh wow - these are all so pretty!!!! Thank you Lori! Thanks for stopping by and leaving me a comment! It truly makes my day every time I see one. Awesome Awesome Awesome! Love all of the beautiful color... love that you used the negative space... love the designs! Love it all! I love all the cards and especially the leaves. Glad you like them! Thanks for stopping by! Hi Shanna - thank you so much! Cute cups and beautiful leaves. love those shaker cards.